Saturday July 30th 1892 I was busy most of the forenoon with the work. Fanny came and took Mother to town for the day. I got the dinner over and did up the Saturday work. I then dressed myself to got to Mrs Jane Sanders tea party. Fanny brought Mother home and took me over. I had a very pleasant time. Fanny brought me home. Edith was eleven years old today and had a little party. Sunday July 31st 1892 It was pleasant forenoon. Mother and I were busy with the work nearly all the morning. The folks were all over from town in the afternoon and I had invited them to stay for supper. There was a rain storm about six oclock. They did not stay to spend the evening. I read and wrote a little. Monday August 1st 1892 I was sick all last night and did not do any more than I felt obliged to. I was lying down part of the time. Tuesday August 2nd 1892 I felt better. We got the Seydel boy to help us wash. I done a little sewing in the afternoon. Will is having his oats cut up on the Folsons land. 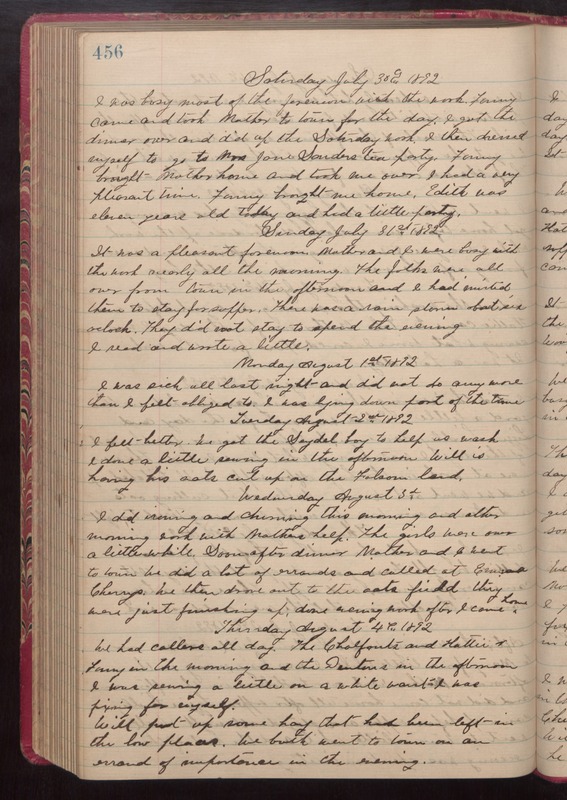 Wednesday August 3rd 1892 I did ironing and churning this morning and other morning work with Mothers help. The girls were over a little while. Soon after dinner Mother and I went to town. We did a lot of errands and called at Emma Cherrys. We then drove out to the oats field. they were just finishing up. Done evening work after I come home. Thursday August 4th 1892 We had callers all day. The Chalfonts and Hattie & Fanny in the morning and the Dentons in the afternoon. I was sewing a little on a white waist I was fixing for myself. Will put up some hay that had been left in the low places. We both went to town on an errand of importance in the evening.